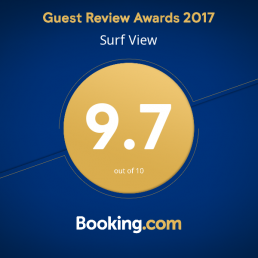 For 2017, JBay Surf View received the Booking.com “Guest Reviews Award” and a score of “9.7”. A great way to showcase our excellent reviews and guest experiences. We are very proud of this achievement and will continue to strive for excellence during 2018. Happy clients is our main goal! Thanks to all our guests for all the positive words and hope to welcome you again soon.